But there is a whole lot more below the waterline! DID YOU KNOW? Eagle projects, rank advancement, and service projects return over $750,000 to our Eastern Idaho, Western Wyoming communities. To protect volunteers, chartered organizations, staff members, and properties. For registration, publications, and other program support--only a phone call away. For two Cub Scout Day Camps, three Boy Scouts Camps and a High Adventure Base. For advanced training camps such as Wood Badge and National Youth Leadership Training - Cedar Badge, and Powederhorn. Tents, cooking equipment, camp vehicles, building repairs, canoes, equipment replacement and repair, and general upkeep of Council camps. For leaders who complete training, volunteer for special projects, and help in many Scouting roles. Work with volunteers to organize new units, manage fund-raising programs, conduct trainings, assist membership recruitment, provide counsel and direct support for districts, camps, and programs. Postage, computers and links to the National BSA Computer System, copy machines, folding machines, and printing shop. Operations, utilities, insurance, repairs, and remodeling throughout the council's four service centers in Rexburg, Idaho Falls, Blackfoot, and Pocatello. Used in training, at camps, and in volunteer meetings. Mailings to leaders, parents, and youth members. The Council maintains a website to describe programs and prodecures as well as convenient event management systems. Everything from Program planning kits and Program helps to camping cookbooks. DID YOU KNOW? Friends of Scouting support the community through Scouting for food which collected over 389,000 food items to feed needy Eastern Idaho/Western Wyoming families. Much of the costs of the Scouting program, including running the Council camps, record keeping, distribution of printed and electronic materials, training programs, support staff, and insurance are hidden beneath the surface, just like an iceberg. The 80 percent that isn’t visible is what keeps the rest afloat. 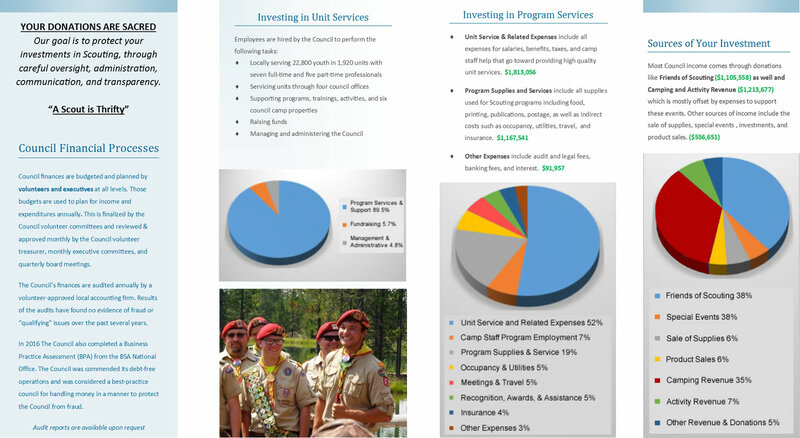 35% of the Grand Teton Council budget is generated by donations from Friends of Scouting. This budget is prepared and controlled by local business, religious, and community leaders. It costs the Grand Teton Council $125 per youth to operate and provide council services. That is less than $11 per month - a real bargain when you think of the experience, values, and training your child is receiving. $125 covers the cost of one youth for one year. You may choose to do more or whatever your budget will allow. Your cash, check, or credit card contribution in any amount is greatly appreciated. DID YOU KNOW? Friends of Scouting monies stay local! 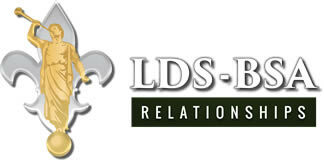 They do not support National BSA operations.